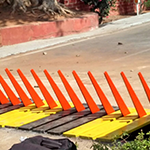 The Enforcer motorized traffic road spike systems provide reliable access traffic control by electro-mechanically moving the teeth up to an active or secured position, and then down to allow unrestricted passage only to authorized vehicles. The self-contained modular system allows design flexibility combined with easy installation in manned or unmanned sites. Enforcer can be installed in new or existing facilities and is easily integrated with multiple access control options. Hump acts as a mild speed breaker as well as provides housing to spikes. Entire unit is installed on road surface therefore no digging is required. Electromechanical drive unit, waterproof, silent and maintenance free. Quick opening & closing time (approximately 2 – 6 sec). Steel structure is capable of withstanding 25 – 30 tones vehicle load.